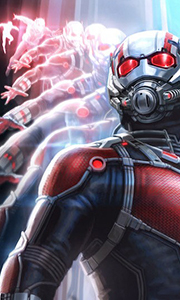 Marvel Studios introduces the newest member of the Avengers: Marvel’s Ant-Man. Armed with the amazing ability to shrink in scale but increase in strength, master thief Scott Lang joins forces with his new mentor Dr. Hank Pym to protect the secret behind his spectacular Ant-Man suit from ruthless villains! With humanity’s fate in the balance, Pym and Lang must pull off a daring heist against insurmountable odds. This action-packed advent..
Own Marvel Kawaii - Ant Man Mug from Deff, DVD, Blu-Ray & 4K Video Specialists - Free UK Delivery..
Own Ant-Man 1 / Ant-Man 2 Blu-Ray from Deff, DVD, Blu-Ray & 4K Video Specialists - Free UK Delivery..
Own Ant-Man 1 / Ant-Man 2 DVD from Deff, DVD, Blu-Ray & 4K Video Specialists - Free UK Delivery..
Own Ant-Man and The Wasp - Giant-Man Mug from Deff, DVD, Blu-Ray & 4K Video Specialists - Free UK Delivery..
Own Ant-Man and The Wasp - Hex Heads Mug from Deff, DVD, Blu-Ray & 4K Video Specialists - Free UK Delivery..
Own Ant-Man and The Wasp - Team Mug from Deff, DVD, Blu-Ray & 4K Video Specialists - Free UK Delivery..
Own Ant-Man And The Wasp 3D Blu-Ray from Deff, DVD, Blu-Ray & 4K Video Specialists - Free UK Delivery..
Own Ant-Man And The Wasp 4K Ultra HD from Deff, DVD, Blu-Ray & 4K Video Specialists - Free UK Delivery..
Own Ant-Man And The Wasp Blu-Ray from Deff, DVD, Blu-Ray & 4K Video Specialists - Free UK Delivery..
Own Ant-Man And The Wasp DVD from Deff, DVD, Blu-Ray & 4K Video Specialists - Free UK Delivery..